Rentokil Steritech have identified climate change as a factor that is accelerating the damages caused by pests, which could result in a wider spread of infectious diseases, increased crop destruction, extensive electrical damage and food safety issues. 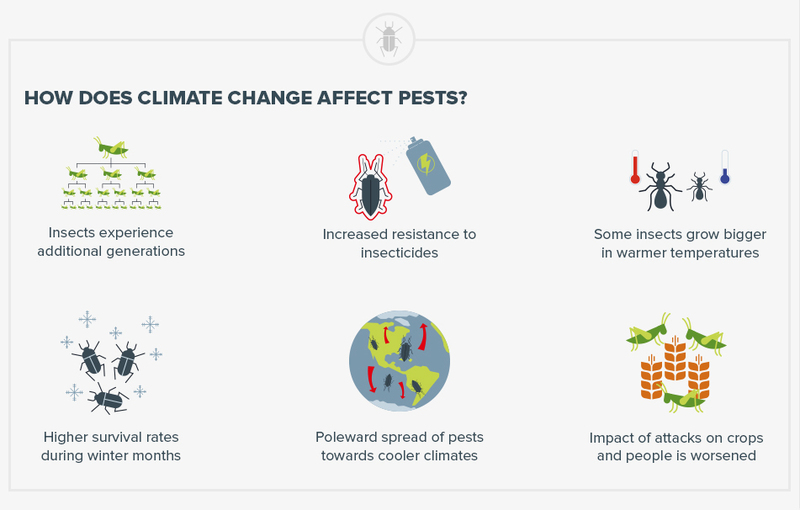 As most pests are more prevalent in warmer climates, the impact of an increasing temperature could be potentially devastating to public health and food production. The combination of increased C02 levels and global warming could mean that areas, which are currently uninhabitable for pests could soon become fertile breeding grounds. Not only do most pests breed better in warmer temperatures but some species tend to grow bigger and increase their resistance to insecticides. Furthermore, for most species an increasing temperature is likely to lead to a higher survival rate during winter months. Vector-borne infectious diseases, such as malaria, dengue virus, Zika virus and Lyme disease affect nearly half of the world’s population, and can create international public health emergencies. The outbreak of Zika virus, which was spread mainly by mosquitoes during 2015-16, was widely linked to global warming by the scientific community, following a spell of unusually high temperatures. The Asian Tiger Mosquito, a known vector of dengue virus, chikungunya virus and dirofilariasis, is a species native to Asia, however, due to increasing temperatures, the mosquito is now spreading rapidly across Europe and the US where it is now present in 32 states. With the global temperature expected to increase by around 2°C (35.6°F) in the next few decades, Rentokil Steritech expects to see pests migrate to cooler climate environments. This could result in insects becoming a bigger threat to food safety and production, as they become more resistant to insecticides and experience additional generations. The Coffee Berry Borer, which is now present in virtually every coffee-growing region in the world including Hawaii, is a key example of this effect in action. It is estimated that the beetle causes $500 million in damages to coffee growers each year. « The day of the jackal and a wolf in dogs’ clothing?